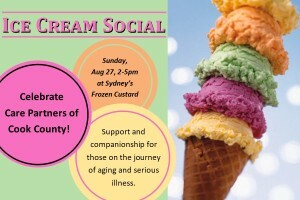 The 2nd annual Care Partners Ice Cream Social will be held on Sunday, August 28th, from 2-5 pm at Sydney’s Custard! The event will include sundaes for a $5 donation, a silent auction, chair massages from Lutzen Reflections Massage Studio and a quilt raffle draw. All proceeds go to support Care Partners services to provide support and companionship for those on the journey of aging and serious illness. Join us to celebrate and learn about our growing services such as companion volunteers, Senior Rides, Senior Chore Program, caregiver support and advanced care planning and to help us ‘kick off’ an important new initiative: Building a Dementia Friendly Community. Supporting our aging population is a community effort—especially with a challenge like dementia that affects so many. The program will train community members and businesses how to interact positively with individuals with dementia. Many thanks to our event sponsors: Sydney’s Frozen Custard, Lutzen Reflections Massage Studios, Red Pine Realty, Joynes Ben Franklin, Ryden’s Boarder Store, Northern Wilds Media, Sawbill Canoe Outfitters, Sivertson Gallery and Sweetgrass Cove. Thank you as well to our Silent Auction donors: Attorney Ruthanne Hedstrom Vos, Crooked Spoon, Great Gifts, Harbor House Grille, Kathy Reeves, Mary Bebie, Stiudio 61 Hair Design, The Blue Moose, Wellspring Therapy and WTIP.